PARIS — Rapid population growth and poor infrastructure have put two out of three cities in Africa at "extreme risk" of the threats posed by climate change, according to a new analysis released on Wednesday. With UN figures showing 86 of the world’s 100 fastest-growing cities are in Africa, experts warned nearly half of the continent’s GDP was exposed to the perils posed by our warming planet. The findings were laid out in the 2018 Climate Vulnerability Index which calculates an overall risk figure from more than 50 separate data sources, including state-of-the-art climate models, socio-economic factors and demographic trends. It found Bangui in the Central African Republic, Liberia’s capital Monrovia and the Congolese city of Mbuji-Mayi to be the three most at-risk cities. "It’s really assessing the ability to withstand climate-related shocks and this is what makes African economies stand out as at risk compared to the rest of the world," said Niall Smith, an environment analyst at Verisk Maplecroft, which compiled the index. The British-based risk consultancy also singled out DR Congo’s capital Kinshasa as being of particular concern for investors. Currently home to 13.2 million people, the city regularly experiences weather events such as cyclones and flooding, which will cause greater disruption as the population swells to 26.7 million by 2035. "Urban population growth at this projected rate will, without doubt, intensify the city’s alarming risk profile," they said. 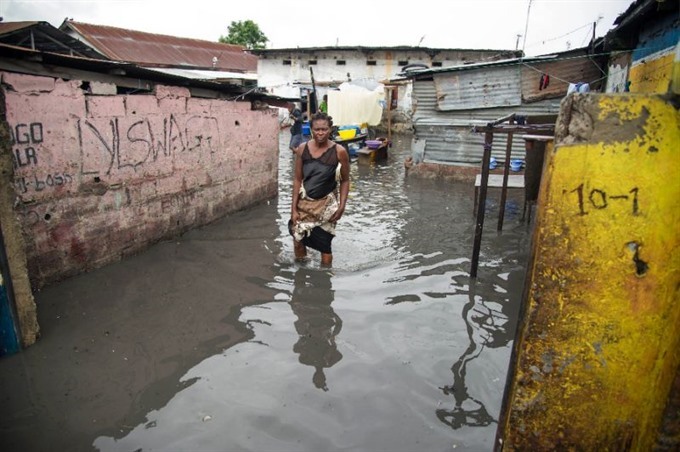 "Africa’s megacities already face issues like lack of clean water, sanitation and shelter." The study found that as much as 47 per cent of Africa’s GDP -- an amount totalling close to US$1.4 trillion -- to be at "extreme risk" from climate change by 2023, significantly higher as a percentage than any other continent. "By no means are we saying don’t invest in these locations," Richard Hewston, principal climate change and environmental analyst at Verisk said. "But climate risk should be one of the elements you consider. There’s a huge opportunity for investors and we would say that you need to go in with your eyes open by doing due diligence beforehand." The data also showed that some of the most populous cities on Earth --including Delhi, Mumbai, Mexico City and Karachi -- were all at "high-risk" of damage to their economies and populations due to climate change. Scientists in May released the findings of a study suggesting that prompt global action to tackle climate change could save the world economy $20 trillion by the end of the century. But in many nations domestic political concerns still trump climate action. Hewston gave New York as an example of a city with the technical know-how and political will to invest in climate defences after it was ravaged by Hurricane Sandy in 2012. "But if you’re looking for other cities, say in Africa, or Dhaka or Mumbai, they also have competing aspects they look to fund so things like climate resilience don’t always top the list," he said.